Taking the photos for this Nancy Hill book was a very sweet assignment. Antigua Guatemala is a unique Central American colonial town spared by modernization thanks to an 18th century royal edict that evacuated the place by law after a series of earthquakes that leveled much of it. Walking Antiguas cobblestone streets to visit the restaurants, tasting mouthwatering delicacies from all around the world, and setting up tasty looking stages in a leisurely way was pure pleasure. 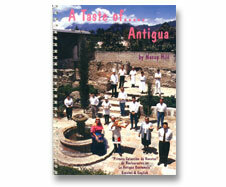 Unfortunately the book is available only in Guatemalan Bookstores.